Plot: In this day an age where picture messaging has all but erased the need to express one’s self through words being an emoji has never been a more stressful job, especially for confused emoticon Gene. Lineage pegs him a meh emoji but when a messaging blunder has him dubbed a malfunction Gene sets off on a quest to find his purpose. With the evil Smiler on his tail, time is running out. Will Gene be able to become the meh emoji he was destined to be or will his one mistake see him erased from Textopolis for good? It’s that typical young love kinda story. You know the one, bumbling boy desperate to over-come crippling shyness in order to impress long-term crush with the help of his emojis…No? Not heard that one before? Well if you’re not a fan of fresh, exciting narratives not to worry, that is the only real original theme in a movie that’s basically one cliché after the other strung together to form a somewhat plausible plot line. 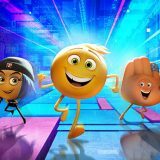 Just to give you a quick breakdown of said storyline, as the son of Mr and Mrs ‘meh’ emoji Gene (T.J. Miller) is desperate to prove himself worthy of the ‘meh’ family name. The problem is being just a meh is foreign to the emoji who – unlike the others – is able to morph into multiple emoticons at will. Misfit Gene, lands himself in scorching hot water when a nervous Alex (owner of the phone in which all the emoji lives) tries to impress his crush by sending her an emoji that’s nonchalantly cool. He calls on Gene but the wannabe meh panics leaving Alex (Jake T. Austin) embarrassed by the random expression he accidently sends over to his crush Addie (Tati Gabrielle). Gene’s failures set off a motion of events that are just as hackneyed as that phrase whereby he embarks on a path to self-discovery, hoping to change his fate before President Smiler’s (Maya Rudolf) team of Anti-Virus Bots can have him deleted for good. 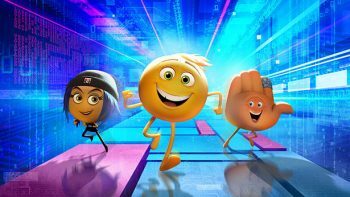 Though it appears an innovative script, The Emoji Movie covers the same old grounds in a less than exciting way. On his quest to self-discovery Gene befriends Hi-5 (James Corden) who doesn’t fall short of the dopey, slightly irritating, (last seasons of Friends’ Joey) sidekick you’d expect. Simultaneously to Alex, Gene also develops feelings for Jailbreak (Anna Faris) a rogue emoji he meets along the way. Aka the typical ‘badass,’ loner with a secret; will she ever learn to love and be loved? I think you know the answer to that question already. Throw in some parents-trying-to-be-cool phrases like ‘get with the program’ and Hi-5’s predictable antics and there just seems to be no escaping the feeling that you’ve seen this one before. Putting Negative Nancy back in her box for the moment, the movie isn’t all bad. In fact it’s a pleasant, easy to digest watch and there are indeed some, dare it be said, entertaining moments. After all, who doesn’t enjoy a gentle jibe at our pathological addiction to repetitively consume YouTube videos? There are also nuggets of relatable references for the keen bean able to spot them – look out for the Star Trek one. Just don’t expect anything too deep. Despite the assembly of some impressive A-Listers (Patrick Stewart as the poop emoji), The Emoji Movie lacks the charm and wit it needs to push through the boundaries of likeable to loveable. Sadly, it’s a meh-face verdict from this movie-lover.